SYRACUSE — Wawasee’s track and field teams split a boys/ girls meet with visiting West Noble Wednesday night, the Lady Warriors winning their dual 88-35, and the Chargers winning the boys meet by a 70-38 margin. Wawasee’s girls won a total of 12 events with Jada Parzygnot claiming top honors in both the pole vault (10’) and the long jump (15’08.75”), Sara Pritchard winning both the shot put (31’09”) and the discus (98’09”), and McKenzie Smith winning both the 1600 (6:37.11) and the 300 hurdles (51.91). Amber Beer won the 100 (14.14), Bailey Mayhew broke tape in the 400 (1:04.63), Nadia Palacios was tops in the 800 (2:45.25), Aiyana Perales won the 100 hurdles (17.59), and Dylan Konieczy won the high jump (5’). Smith earned a third win as part of the Lady Warriors’ 4×800 relay team alongside Mayhew, Emma Ebright and Courtney Cox (10:58.87). 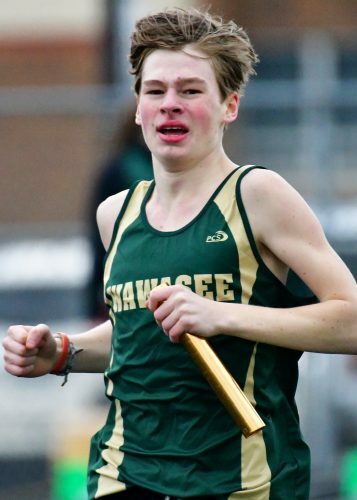 Luke Griner led Wawasee’s boys with a trio of wins, setting the pace in the 800 (2:06.86) and 1600 (4:56.6) and starting off the Warriors’ winning 3200 relay team, which included Spencer Hare, Michael Hammer and Thomas Conley (14:13.27). Hare collected a second win in the 400 meters (55.52), where Jayden Boyer finished third, and Isaiah Tipping set the distance in both the shot (52’08.5) and the disc (125’01”). West Noble’s boys showcased their depth, sweeping the top three spots in the 200, the long jump and both hurdles races, and the Chargers went one-two in both the pole vault and the high jump. Wawasee’s girls improved to a 2-0 start, while the boys crew dipped to 0-2. The Lady Warriors will open their Northern Lakes Conference schedule at Concord April 9, and the Warriors will begin their NLC slate the following Thursday when they play host to both Concord and Plymouth.